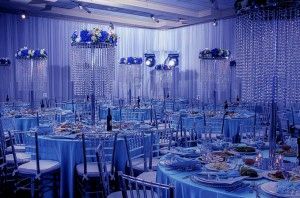 The decorated wedding rooms are not only with the classic white or ivory or cream, one of the favorite colors and fashion is all about decorating wedding receptions is blue, in all its shades and varieties. 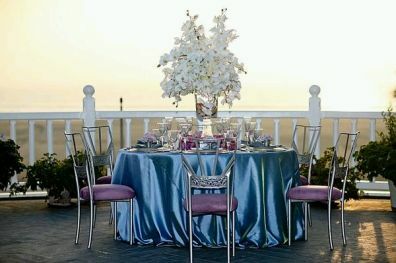 This color conveys peace and tranquility, but at the same time is extremely elegant, if you're one of those brides who want to challenge the traditional and go for something more original, the images that we present below may help you. 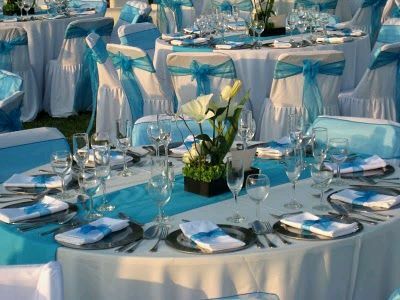 In this first option we have a white room decorated with blue, which together with elongated white arrangements, tables and chairs in the same color, make the place a very elegant. 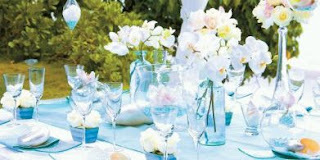 Another option, other than the first, but just as beautiful, this decoration is lighter, less elegant than the first, is to complement the trim white and blue flowers with crystals, like a curtain, hanging from them, light blue is present on the tablecloths and napkins, tables, lamps also used blue tones. 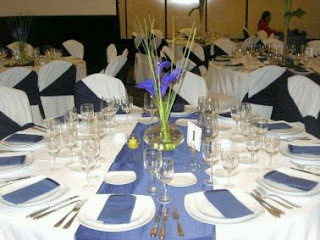 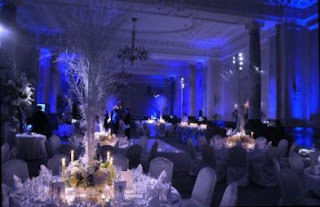 It is not always necessary to use blue lights and arrangements, sometimes enough to dress appropriately tables and chairs, as seen in this picture. A sophisticated proposal , elegant and unique touch of originality mark the fabric used for the tablecloth. 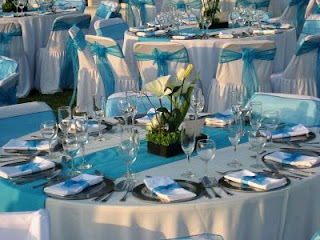 Romantic proposal is the perfect combination of light and blue tablecloths. This proposal is the presentation of a table with napkins and blue stripe and an arrangement with a touch of the same color, enough to achieve an elegant decor. 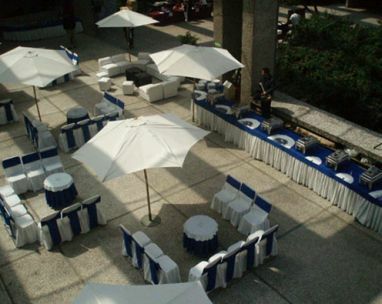 Aerial view of how well a place is decorated appropriately, in this case especially in blue. 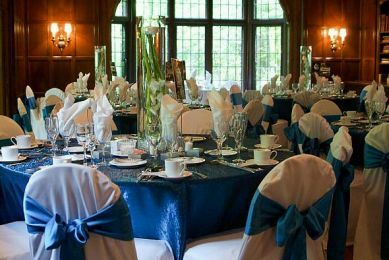 Fresh and elegant presentation, ideal for a marriage performed during the day, the contrast of white and blue does all the work. Another option with tablecloths and blue lights, beautifully arranged and combined with white chairs. 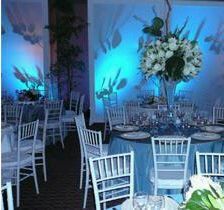 Finally, the white flowers are the best to complement blue arrangements, this particular presentation is ideal for outdoor weddings. 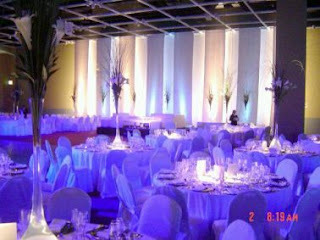 I hope we have been helpful.